The Denver Broncos play at Sports Authority Field at Mile High in Denver, Colorado. The Broncos home stadium is the ideal venue for watching an NFL football game in the crisp air of the Rocky Mountains. Look at the Denver Broncos seating chart to see the seating options offered at Sports Authority Field. Also read through BroncosSeatingChart.com for additional details about the best chance to find cheap Broncos tickets for the best seats at Mile High. The Denver Broncos Sports Authority Field at Mile High is separated into different seating locations: Broncos United Club, Broncos Field Level Prime, Broncos Field Level Between Goal Lines, Broncos Field Level Corner End Zone, Broncos Field / Plaza Level End Zone, Broncos Third Level North End Zone, Broncos Upper Level Sideline, Broncos Thunder, CO Corner End Zone, Broncos Upper Level North End Zone. The best Sports Authority Field at Mile High tickets are determined by seating area and location. The bulk of Broncos tickets are sold to long-term buyers through the team’s season ticket waiting list. Sports Authority Field at Mile High has been the home field for the Denver Broncos since 2001 when it replaced the old Mile High Stadium that served as the team’s home since the Broncos were founded in 1960. 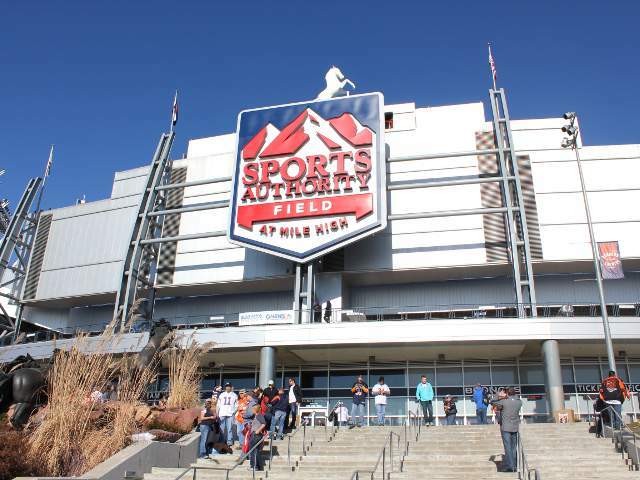 The stadium was originally called Invesco Field at Mile High from 2001 to 2011 until the financial services company sold the naming rights to the Sports Authority sporting goods chain before the 2011 season. The total seating capacity of Sports Authority Field is 76,125 for football games with as many as 100,000 fans having been admitted into the building for concerts. See the Sports Authority Field at Mile High seating chart for further information about the seating options available for Broncos games.